“In 1983, Honda introduced the Shadow series of motorcycles in an attempt to address the needs of the American cruiser market with the VT500c and VT750c”. Is it Up To Us All as Shadow Owners to Keep the Honda Shadow brand alive…. The Honda Shadow refers to a family of cruiser-type motorcycles made by Honda since 1983. The Shadow line features motorcycles with a liquid-cooled 45 or 52-degree V-twin engine ranging from 125 to 1,100 cc engine displacement. The 250 cc Honda Rebel is associated with the Shadow line in certain markets. In 1983, Honda introduced the Shadow series of motorcycles in an attempt to address the needs of the American cruiser market with the VT500c and VT750c. However, due to tariff restrictions in the United States on imported Japanese bikes over 701 cc, the VT750c was reduced to 700 cc in 1984 and was sold as the Vt700c. In 1985, the tariff was lifted and the line soon expanded to an 1,100 cc bike the VT1100c. The VT750c was replaced by an 800 cc version the VT800c in 1988. The VT600c was launched in 1988 as Honda’s new entry level Shadow though still slotted above the Honda Rebel. The line changed little until the introduction of the 750 cc Honda Shadow Ace in 1997. From 2000 to 2007, the Honda Shadow Sabre replaced the VT1100 until the 1,100 cc class was discontinued in favor of the new VTX line, specifically the 1,300 cc offering known as the VTX1300. As of 2011, the Shadow brand has been limited to a single 750 cc cruiser available in Spirit, Aero, Phantom, and RS trims. All other offers are known under the VTX or Rebel brands. The RS and Phantom are the 2 latest additions to the 750 cc line-up from year 2010. Both are Fuel injected. Shadow RS recalls a flat track racing bike with chain drive, a ‘peanut’ style gas tank and a slightly higher seat height ( 29 inches ) with foot pegs less forward than conventional cruisers ( meaning a more standard seating position). Phantom is more like a conventional cruiser in ergonomics. The Honda 125 is mainly for the UK and Europe market, as it fits within the restrictions placed on learner drivers in the UK and the light motorcycle license in Europe. It also has a chain drive instead of a shaft drive seen on the larger engined bikes. Sales ended in 2009. The 500cc “VT500C” introduced in 1983 featured chrome side covers and black engine covers. The headlight was chrome and rectangular and had a single horn. The engine was the Honda VT500, a 491 cc (30.0 cu in) OHC three-valve, liquid cooled V-Twin with a six-speed, shaft drive transmission. The 1985 “VT500C” had round and chromed headlamps. This model continued with the dual horns. A two piece seat with an integrated backrest was incorporated. Starting this year, the engine covers were polished chrome and the fins enlarged. The “Honda” tank decal was curved instead of straight. For the 1986 model year, the “VT500C” model was virtually the same as the 1985 model. The “VLX” “Shadow 600” (aka “VT600C“) was introduced as a new model in 1988. It has a single shock rear suspension, a low 27.1-inch (690 mm) seat height and a long 63.2 inches (1,610 mm) wheelbase with a 2.4 US gallons (9.1 l; 2.0 imp gal) fuel tank. The engine is a 583 cc (35.6 cu in) SOHC three-valve liquid cooled 52-degree V-Twin with a four-speed transmission and chain drive. The wheels are spoked. In 1989, The VLX VT600C remained largely the same. The VT600C was not made in 1990 but did make a comeback in 1991 offered only in black. The engine and body style was retained from the 1991 model year. A new deluxe version “VT600CD” introduced in 1993 added more chrome on the engine cases and valve covers. The seat on the deluxe version is soft and tucked. By 1994 the Deluxe model was a standard offering for every year the VLX was made. The “VT750C” also introduced in 1983 with the VT500c. Special identifying features of this model are the round head lamp, instrument casings and the chromed front fender. The backrest was standard equipment. The painted side covers had the “Shadow 750” decal. The engine is a 749 cc (45.7 cu in) SOHC 3-valve Liquid Cooled V-Twin with a six-speed shaft drive transmission. The “VT700C” was introduced in 1984 as a direct result of increased tariffs placed on Japan’s imports. The U.S. raised the import tariffs on engine sizes above 701 cc (42.8 cu in). So the engine size was reduced from a 750 cc (46 cu in) to 700 cc (43 cu in) to get the bikes into the U.S. Special identifying features of this model are the round head lamp and instrument casings with a chromed front fender. The front wheel bore a dual disc brake system and dual horns mounted on the front. The painted side covers had the “Shadow 700” decal. The engine is a 694 cc (42.4 cu in) SOHC three-valve Liquid Cooled V-Twin with a six-speed, shaft drive transmission from 1984 to 1987. New hydraulic valve adjusters and twin plug cylinder heads were used. The “VT750C” was available outside of the USA (Canada and Europe) with a larger engine displacement. In 1985, The “VT700C” model featured polished chrome engine side covers. The engine is the same as the 1984 model year. The “VT750C” was available outside of the USA (Canada and Europe) with a larger engine displacement. In 1986, The “VT700C” model rear fender took on a flair look over the rounded style. The engine is the same as the 1984 model except polished instead of black with the right engine cover graphic painted black. The mufflers were a little lower and changed from the flair look to a more straight style. The front pegs and controls were moved forward, the rear foot peg support bracket became solid and the back rest was optional this year. The cast wheels changed from a ten-spoke to a five-spoke design and the access covers were chromed. The “VT750C” was available outside of the USA (Canada and Europe) with a larger engine displacement. The 1987 “VT700C” model featured the same engine as the 1986 model but with the right engine cover graphic not painted. The side covers are chrome, five-spoke cast wheels with a single front disc brake. The “VT750C” was available outside of the USA (Canada and Europe) with a larger engine displacement. In 1988, the Shadow introduced an 800 powered model. Dubbed the “VT800C”, this bike remained largely unchanged except for the amount of forward gears moved down to four. In 2004, the VT750C Shadow Aero was redesigned with larger valenced fenders to give it more of a retro look. It also moved from chain drive to a sealed shaft drive which decreases the amount of required maintenance. As for the engine, it remained a V-Twin but included 2 spark plugs per cylinder to increase efficiency. It also got rid of the second carb so only a single carb feeds the engine with fuel. Between 2010 and 2013, a restyled VT750RS / Shadow RS (VT750S outside of North America) with an O-ring-sealed chain final drive joined the heavier Shadow Phantom, Aero and Spirit 750 shaft-drive models. Curb weight was 232 kg (511 lb). Honda Japan created a series of VT400 (in Japanese) models for the Japanese domestic market in 1997, practically identical to the VT750 series but with smaller displacement engines. From 2009, Honda Australia imports the VT400 as a Learner Approved Motorcycle alongside the popular VT750. The V-Twin 1100 (VT1100) was introduced Honda in 1985 and was in continuous production till 2007. All models used the same Honda VT1100 engine with minimal mechanical changes during its production. The VT1100C model was introduced in 1985. A quick visual indicator of the ’85-’86 model is dual horns located on the front, turning indicators are square shaped, and one exhaust pipe on each side (front cylinder on right side, rear cylinder on left). Fuel and temperature gauges are located on the tank. The engine is a 1,099 cc (67.1 cu in) SOHC Liquid Cooled V-twin with a five-speed, shaft drive transmission. The 1987 VT1100C model took on a brand-new look with a lower seat (26-inch-high (660 mm)), a longer wheelbase 65-inch (1,700 mm), a 3.44 US gallons (13.0 l; 2.86 imp gal) fuel tank and an 41 millimetres (1.6 in) extended front fork design. Both mufflers were run along the right side, horns relocated to each side of the engine, and a small back rest was brought back. The engine is virtually identical to the previous model, but now has a four-speed transmission and has a hydraulic actuated clutch. The “VT1100C” model was not manufactured in 1991 (to sell off excess stock of 1990 models), but returned in 1992 with a “Made in the USA” stamp on the seat. Visually, the VT1100C matched most of the styling cues of the Harley-Davidson FXDWG. This styling continued through 1994. In 1995, the V-Twin market really got going, and manufacturers expanded their offerings with variants of their standing models. The American Classic Edition (VT1100C2) was introduced this year. It featured more retro styling than the standard with a full rear fender, induced vibrations, and ‘Harley-Davidson-like’ sound from a single pin crank engine. The model also lost about 10 hp. 1997 saw the Standard replaced with the Spirit with more chrome on the engine AKA the ACE but the same basic engine as the standard. An ACE Tourer was also introduced based on the 1100 Spirit engine but the ACE styling. The ACE Tourer came with a two-into-one-into-two exhaust system and hard, color-matched saddlebags. The last of the 6,000+ Tourer models was produced in January 2001. In 1998 Honda rolled out the VT1100C3 Aero, based on the VT1100C2 ACE engine with the single pin crank, but a larger two into one exhaust and more retro styling. The 1100 Aero was discontinued after the 2003 model year, and the shaft-drive VT750C Shadow Aero was introduced as Honda’s only 750 cruiser for 2004. The 750 Aero and ACE ended with the 2003 models. Throughout these years the VLX remained essentially unchanged mechanically but the models and the options were changed yearly, as they were on all models. While many of the manufacturers began to expand 1,500 cc (92 cu in) class model lines, Honda opted to replace the basic Gold Wing Interstate with a basic Valkyrie with six carburetors and boosted engine performance. In 1999 a dressed up Tourer model was added as the Interstate. 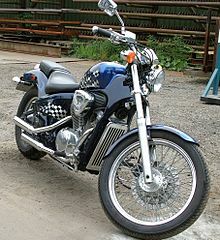 Honda Shadow Sabre was introduced, based on the Honda VT1100 engine. The most notable feature was the front cast aluminium wheel. Every model was a shaft drive. 2007 was the final year Honda made the Shadow Sabre.